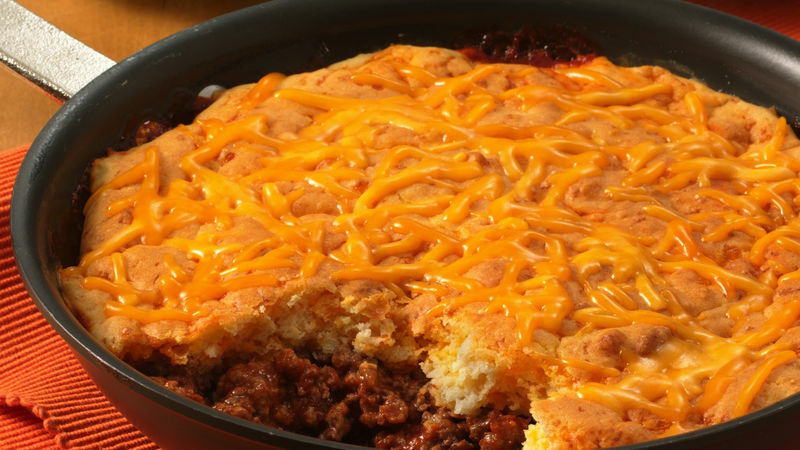 In ovenproof 10-inch skillet, cook beef over medium heat about 8 minutes, stirring occasionally, until brown; drain. Stir in ketchup, salt and tomato sauce. Heat over medium-high heat, stirring occasionally, until hot. Pour Bisquick mixture over top. Bake 25 to 30 minutes or until golden brown. Sprinkle with remaining 1/2 cup cheese. Beef mixture can be microwaved. For step 2, crumble ground beef into microwavable 2-quart casserole. Cover and microwave on High 6 minutes, stirring every 3 minutes, until no longer pink; drain. Stir in ketchup, salt and tomato sauce. Cover and microwave on High 4 minutes or until hot and bubbly; stir. Pour Bisquick mixture over top. Continue with step 3, baking in the casserole 27 to 32 minutes.